You go for the full Spanish immersion in Cusco right? Of course you are! we’ll be happy to contact you with a local Peruvian host family. Most families do live a bit out of the city center in residential neighborhoods, this is something you need to consider. However, local transportation is cheap Cusco has a wild and amazing public transport system and a taxi costs only a dollar or two. The standard home stay option includes two meals a day. You will mostly have a private room and get a key of the front door. This gives you a relative freedom to leave and arrive when you wish. However, if you want to arrive home every day after midnight, a host family might not be your best choice. The families in Cusco will be happy to have you around and enjoy the interaction with our Spanish students. Not many of them have internet connections, but there are many cybercafés in town. Some of them are complete families with parents and kids; others are one-parent families only, others have no kids, and sometimes also the grandmother and a few other relatives will be around. You pay $ 20 per night per person + a one time $ 25 accommodation fee per family (so, if there are two of you in one family, you pay only once!) This includes the accommodation itself in a single room, two meals and the greatest Spanish immersion ever. The $ 25 intermediation needs to be paid to Intensity Spanish Club; once you pay,we give you the details of your host family; you pay your complete stay directly to your host family on the first day of arrival, in cash USD $ or local currency (Peruvian soles). In exchange for the fee we promise you safe, nice, pleasant host mums that are evaluated on a regular base and that are monitored through regular student feedback. All of them are ready to give you a great experience while living in Cusco and learning Spanish. In Cusco you can find many (small) family hostels or low budget backpacker hostels where you will pay approx. 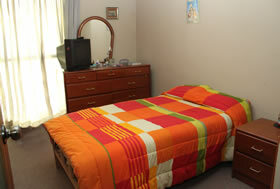 20 – 30 soles per night per bed (in a dorm). The accommodation is basic, but mostly, fine. You cannot expect to have 24 hours of hot water, but you will be able to have a nice but short shower every now and then. In the past those places were mostly Peruvian owned, but now there are more low-budget hostels owned by foreigners as well. Cusco has a wide variety of hotels, some of them really amazing. Nice and a bit fancy hotels start at $ 60 - $ 70 per double room per night and at the higher end you pay $ 250 - $ 350 for a double room. Cusco offers accommodation for all budgets.